Well, this is awkward. Once again we’ve let things lie fallow for far, far too long. We all (= Andy, Mike, and I) feel rotten about it, but more importantly, we now have a finite list of stuff that we need to finish the data haul, and then we can finally do the analyses, write the paper, and generally make good on everything we set out to do. Bell, PR, Evans, DC (2010) Revision of the status of Saurolophus (Hadrosauridae) from California, USA. Canadian Journal of Earth Sciences 47, 1417-1426. Butler RJ, Liyong J, Jun C, Godefroit P (2011) The postcranial osteology and phylogenetic position of the small ornithischian dinosaur Changchunsaurus parvus from the Quantou Formation (Cretaceous: Aptian–Cenomanian) of Jilin Province, north-eastern China. Palaeontology 54:667-683. McDonald, A. T., Barrett, P. M. and Chapman, S. D., 2010. A new basal iguanodont (Dinosauria: Ornithischia) from the Wealden (Lower Cretaceous) of England. Zootaxa, 2569, 1-43. Cuthbertson, R. S. and Holmes, R. B., 2010. The first complete description of the holotype of Brachylophosaurus canadensis Sternberg, 1953 (Dinosauria: Hadrosauridae) with comments on intraspecific variation. Zoological Journal of the Linnean Society, 159, 373-397. Ezcurra, M. D., 2010. A new early dinosaur (Saurischia: Sauropodomorpha) from the Late Triassic of Argentina: a reassessment of dinosaur origin and phylogeny. Journal of Systematic Palaeontology, 8, 371-425. Godefroit P, Pereda Suberbiola X, Li H, Dong Z-M (1999) A new species of the ankylosaurid dinosaur Pinacosaurus from the Late Cretaceous of Inner Mongolia (P.R. China). Bulletin de l’Institut Royal des Sciences Naturelles de Belgique 69-Supp. B: 17-36. Longrich, NR (2011) Titanoceratops ouranos, a giant horned dinosaur from the late Campanian of New Mexico. Cretaceous Research 32: 264-276. Martinez, R. N., Sereno, P. C., Alcober, O. A., Colombi, C. E., Renne, P. R., Montanez, I. P. and Currie, B. S., 2011. A basal dinosaur from the dawn of the dinosaur era in southwestern Pangaea. Science, 331, 206-210. Riabinin ANN (1945) [Dinosaurian remains from the Upper Cretaceous of the Crimea] (in Russian). Vsesoy. Nauch.-Issledov. Geol. Inst. Matl. Paleontol. Strat. 4: 4–10. Ryabinin AN (1939) The Upper Cretaceous vertebrate fauna of South Kazakhstan, Reptilia; Part 1, the Ornithischia. Transactions of the Central Geological and Prospecting Institute 118: 1-38. Wang X, Pan R, Butler RJ, Barrett PM. 2011 (for 2010). The postcranial skeleton of the iguanodontian ornithopod Jinzhousaurus yangi from the Lower Cretaceous Yixian Formation of western Liaoning, China. Earth and Environmental Science Transactions of the Royal Society of Edinburgh 101: 135-159. 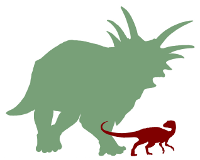 Zhao X, Li D, Han G, Zhao H, Liu F, Li L, Fang X (2007) Zhuchengosaurus maximus from Shandong Province. Acta Geoscientica Sinica 28: 111-122. This entry was posted in Progress Reports, To-Do List. Bookmark the permalink. What’re the plans for ODP over the summer? David Dreisigmeyer on Some (finalish) results! Fernando Racimo on Some (finalish) results! William Miller on Some (finalish) results! Matt Wedel on Some (finalish) results! The opinions expressed here represent our own, and not those of our employers or any other organization with which we are associated.